Is paper piling up at your home or business? Bring it to ECHOS SHRED DAY! April 27th! All documents are shredded securely on site, and shredding certificates will be provided upon request. In October we will also accept electronics for recycling. 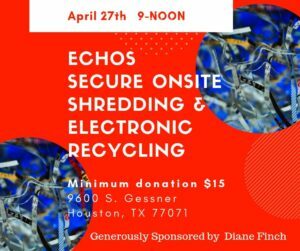 We will accept electronics at the April 27th Shred Day. We are also scheduled for October 19th for Shred Day. Location: 9600 S. Gessner – corner of Bissonnet. Drive up, get a donation receipt and we’ll unload your car for you! It is just that easy! Businesses and individuals welcome. All documents are shredded securely on site, and shredding certificates will be provided upon request. In April we will also accept electronics for recycling. At Shred Day we also host a Food Drive for non-perishable food items for the Food Pantry. The event is held in the parking lot at The Episcopal Church of the Epiphany – 9600 S. Gessner Road, Houston TX 77071. Please bring a donation of non-perishable food for our Food Pantry when you come to Shred Day. Baby Food, Peanut Butter, canned vegetables, canned tuna, spaghetti, canned beans, and diapers make a difference to the families we serve Please contact Kathy Eckhardt, 713-270-0369, for information. Sponsorship’s are only $575 and pay for the Shred Truck to come to ECHOS. Click here for the online donation/sponsor form. A sponsorship covers the costs related to hosting this event. Sponsors’ names, logos and other information will be featured on all print materials, ECHOS website, e-newsletter, social networks, AND we are able to distribute coupons or other information about your business at the event at your request.